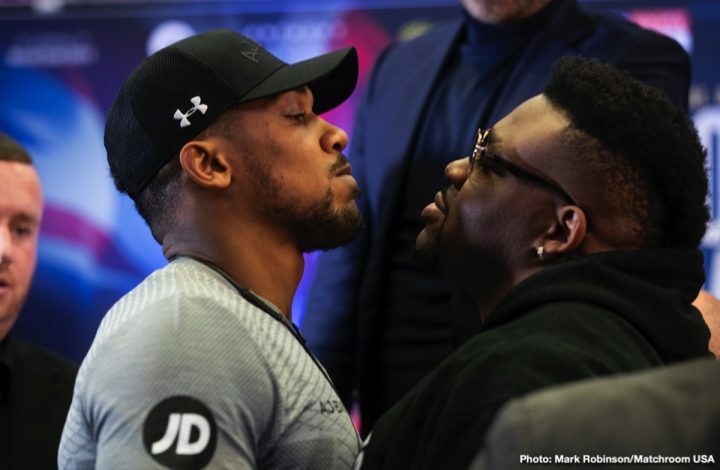 By Tim Royner: Jarrell “Big Baby” Miller (23-0-1, 20 KOs) says it doesn’t matter what kind of performance enhancing drugs [PEDs] IBF/WBA/WBO heavyweight champion Anthony Joshua (22-0, 21 KOs) is taking, he still lacks the heart, and conditioning needed for him to beat him when they face each other on June 1 on DAZN at Madison Square Garden in New York. Miller, 30, says the only reason Joshua is the favorite in this fight is because he’s so popular. He’s a 2012 Olympic gold medalist, and he has a lot of boxing fans from the UK that back him. Miller states that Joshua hasn’t fought anyone that was young and talented other than former WBO champion Joseph Parker. Although Joshua fought and beat Wladimir Klitschko and Alexander Povetkin, both of them were at near 40-years-old at the time he beat them. “He takes a lot of shots in the beginning of his fights, and he tends to wear guys down to lang big combinations,” Miller said about Joshua. “It doesn’t matter whatever PEDs he wants to take or whatever he wants to take. It won’t work for him. There’s something that’s called heart. You can’t take vitamins to get that,” Miller said of Joshua. “You’re either born with a gas tank or not born with a gas tank,” Miller said in taking a shot at Joshua, who is known for having poor stamina. “You can run a million miles, and it ain’t going to happen. Sometimes when they move a guy fast, they don’t have time for their lungs to develop for a 12 round fight,” Miller said. Miller is dead on correct in talking about Joshua’s gas tank or lack thereof. Fighters that possess weight lifter/bodybuilder physiques tend to gas out often when they’re forced to fight at a fast pace. That’s just the way it is. Guys that are built for power aren’t blessed with great cardiovascular systems. If you take a bodybuilder and run him long distance, they’re going to gas out on you. They can trot, but they’re not going to be able to keep up with someone that’s in shape and carrying around a lot less muscle. Boxing is a cardio sport. The guys with huge muscles are dangerous in short bursts. When they’re allowed to get a lot of rest breaks, they remain dangerous with their ability to throw explosive shots. The trick to beating them is to force them in a fast pace fight where they need to throw a lot of shots and not be given rest breaks. Miller is someone that has the fighting style that can give Joshua loads of problems, but in order to do that, he’ll need to be able to handle his power shots before he gasses out. That’s obviously easy to do. Wladimir Klitschko did it, and came close to knocking Joshua out in the sixth round. Wladimir likely would have knocked Joshua out if he’d taken the fight to him after he gassed in the sixth round in their fight in 2017. “You can’t knock everybody out, but I can box for 12 rounds,” Miller said. “It doesn’t hurt my ego that I can’t knock them out. Some of the greatest fighters ever didn’t have crazy knockout power. But if you put enough combinations together, you get them out of there. I don’t have one-punch knockout power, but if you watch the way I throw my punches, I’m just touching them with good shots, and I get them out of there and that’s boxing. You can’t throw power on everything,” Miller said. Most boxing fans believe that Joshua is going to get Miller out of there immediately on June 1. The ones that don’t see Joshua scoring a quick knockout, see him wearing the 315 lb Miller out in the first six rounds and knocking him out. They see Miller as being too slow, and too easy to hit for him to be able to last long. Dillian Whyte isn’t very fast, and he was able to hurt Joshua by fighting hard for for the first two rounds. Joshua gassed out against Whyte, and was fighting on fumes from rounds three to six. It took Joshua three rounds before he got his second wind. That was the same thing we saw in Joshua’s fight against Klitschko. Joshua gassed out in the sixth and stayed tired until the tenth round. Klitschko’s bumbling mistake of choosing to box when Joshua was gassed and hurt allowed him to regroup and come back to stop him in the 11th. Miller has already said that if he gets Joshua hurt, he’s not going to need to be told to go after him to finish him. Miller knows that already, and he won’t lack the courage to finish the job. “He’s been backed up by every fighter he’s ever fought,” Miller said about Joshua. “Even Charles Martin backed him up a little bit, but Charles Martin quit. Carlos Takam, 6’1″ 230 pounds, backed him up. [Alexander] Povetkin 6’2″ 230 lbs backed him up. Everybody backs him up. You think a 300 lb man, who’s not going to stop, isn’t going to back him up and throw more punches?” Miller said. Joshua instinctively backs up when he’s under pressure, because he has such a poor gas tank, he can’t stay in the pocket and trade shots at a fast pace. If he does that, he’ll drain down like a battery and have nothing left. That’s why Joshua backs up when his opponents come at him. He likes to control the pace of his fights, and the only way he can do that is by backing up. Another reason why Joshua backs up is he doesn’t have the greatest punch resistance. Joshua has a ton of bodybuilder muscles, but he doesn’t take a good shot. You can argue that a lot of Joshua’s opponents have better chins than he does. If Joshua had to face someone like himself with good power and aggressive fighting style, he’d likely be knocked out quickly in the first couple of rounds every time. He doesn’t handle taking shots very well at all. Wladimir, Whyte, Carlos Takam and Povetkin all had Joshua hurt. “I’m the underdog because he’s popular. That’s all it is,” Miller said in giving his analysis of why the odds-makers have him as the underdog against Joshua for their June 1 fight. “Look at the states; look at the numbers. Everybody doesn’t look at Klitschko’s age, and don’t look at Povetkin’s age. The only decent person he’s fought is Joseph Parker,” Miller said. Parker was given a bad deal in his fight with Joshua due to the referee now allowing inside fighting. Parker was trapped on the outside the entire fight with Joshua. It was shocking how much that referee hurt Parker’s game. Given how Parker was forced to fight on the outside for the 12 round fight, there should have been a rematch ordered by one of the sanctioning bodies.